Start Khabarovsk (home stay - 3 Donskoy Lane) N48º28.198' E135º03.357' 14 meters . Walking tour of the city . . . .
Khabarovsk train station . . . . Finish Aboard Train #006 - Okean (Khabarovsk to Vladivostok) . . . . Weather: Clear, sunny, very hot and humid. Regular breeze. Another lazy morning - we sleep in as we did not sleep too well last night. Not sure if it was the jet lag, the heat or the fact that we had an evening nap. We had breakfast in the small kitchen, sitting at the tiny table that could just fit three people on the stools provided. We had a basic, but filling breakfast. A couple of fried eggs, some fried luncheon meat and the Russian equivalent of hash browns, which we ate with some brown bread and washed down with luke-warm tea. We have noticed so far that they do not seem to serve their food and drink piping hot. After breakfast, we take a quick shower and then get ready to head out and continue our exploration of the city. Today is going to be a real scorcher - it is clear, sunny and very hot. We decide to walk down Ul Lenina towards the river. This is one of the other major streets in the city, but not as nice as the boulevard that we walked down yesterday. We try to stay on the shady side of the street. After about 45 minutes of slowly strolling along, we make it to the edge of the river and the World War Two monument. 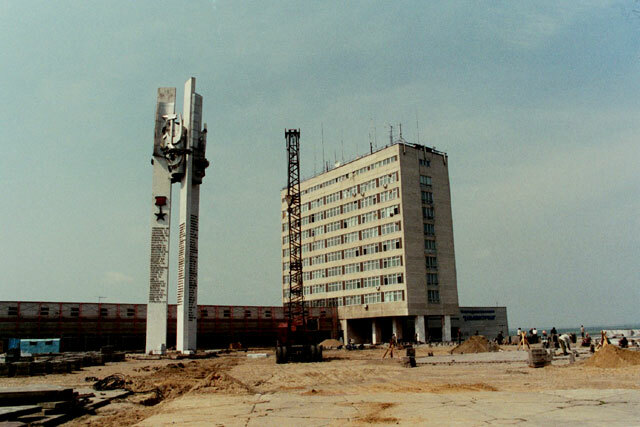 There is a square with a tall tower in the middle. At one end is what appears to be a government building, and on the other side they are constructing a new church. Just slightly down the slope is the actual memorial itself. We approach from the back, where it appears to be a poorly done concrete block structure. But when we come around the edge and and see it from the front, we are flabbergasted. Lonely Planet describes it as "bombastic" - we are not sure about that. 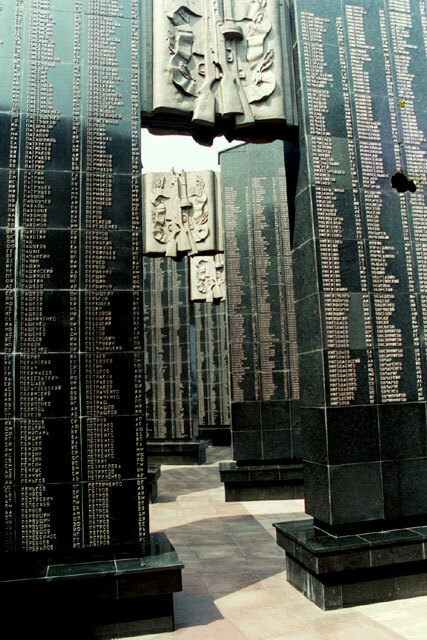 If so many people from this city or region had made the ultimate sacrifice during that conflict, we see nothing wrong with building a monument that lists out every name of those that were sacrificed. And the list of names seemed to be endless. There is the half circle that arcs around, with the eternal flame at the center and names listed all along the sides spread out from there. But that is not enough room - additional huge walls of names jut out from the arc, listing on each side the many thousands more that lost there lives. 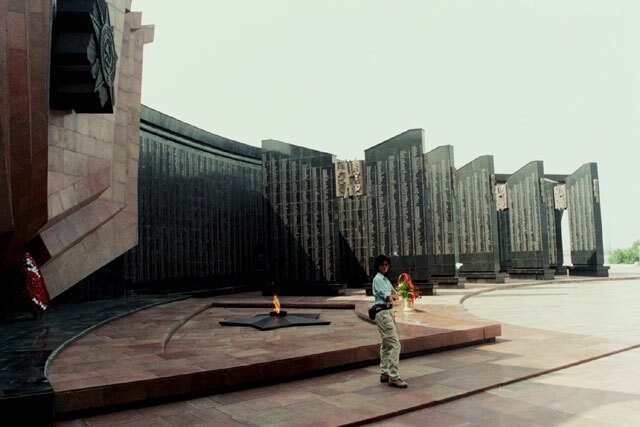 We take our time walking through the monument, taking in the site and silently paying our respects. Then it is down the slope to the rivers edge where we were yesterday. But we do not walk along the river, but rather carry up the slope on the other side and go and visit the military museum. Another interesting museum, where most of the displays are lost on us as everything is in Russian. But many of the displays are interesting in their own right. Once we have finished going through the museum, we head out into the courtyard. 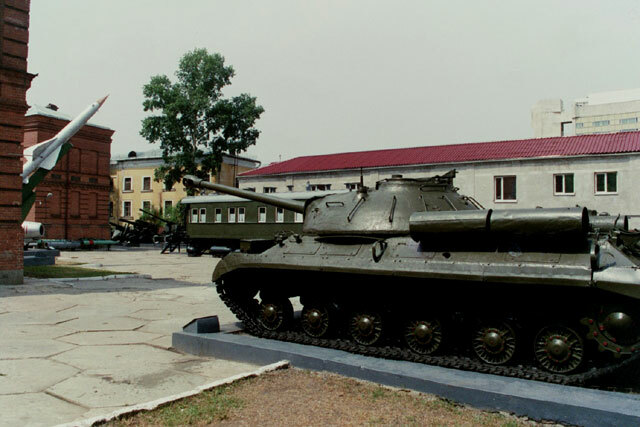 Here are located a number of different tanks - from a small tiny one that does not deserve the name "tank" to the venerable T-34 to some of the more modern ones. 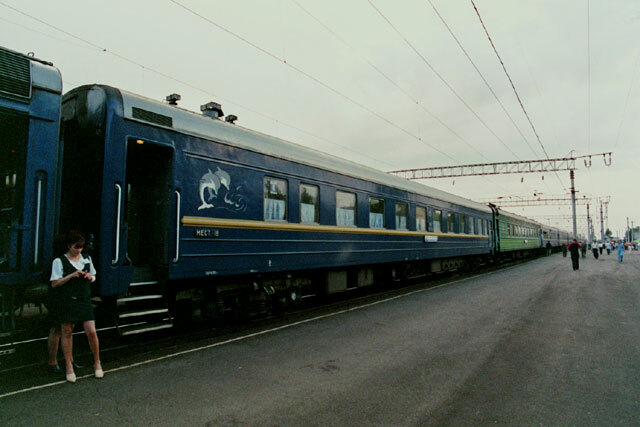 In addition to a few artillery pieces and torpedoes, there is a luxury train car that had been used by high ranking officers when taking the train across and around Siberia. We tried to get inside and take a look, but it is closed. It is now lunch time, so we head to Ul. Muravyova-Amurskogo to grab a bite to eat at one of the many cafes that line this busy street. After lunch, we just go for a stroll along the street, people watch and check out some of the buildings we missed yesterday. After a brief stop at the internet cafe to check on our emails, we decide to take a break at one of the many outdoor drinks (really beer) stands that are set up every where. They are very simple affairs, but very popular. Plastic tables and chairs with umbrellas or plastic tent and a portable bar. They are always very busy with men and women drinking beer and munching on snacks. It appears that you can also bring your own food. We find one of these beer bars right on the sidewalk, grab a beer and some chips and just sit back and relax. The weather is perfect and the ladies walking by are perfect. We just hang out there for about 45 minutes and relax. But then it is time to go. We have a train to catch. 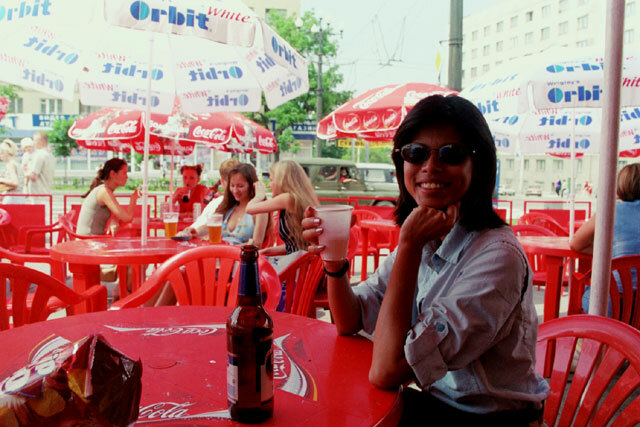 We head over to Lenin Square, then up along Karla Marxa and back through the park and by the ponds and after a quick stop in a shop to pick up some supplies, arrived at our home stay. After a brief wait outside (they did not seem to hear the bell ring), we had a quick shower, finished packing, said our goodbyes and loaded ourselves into a taxi they had called for us. It was a quick 10 minute ride to the train station, where we paid the driver and then sorted ourselves out. The station is under renovation and there are not many signs, so we were not quite sure where to go to catch our train. After a brief wander, we found a small sign board in a dark corner that listed the trains. The track number for our train was not listed yet, so we just found a relatively quiet spot to place ourselves and wait. The place is certainly busy, with people going here and there. After a while, our track number is posted, and we go in search of the track. The only problem is that we cannot seem to find track number 1. We go up on to platform 2, and see our train on one side of the platform with this confirmed by a couple of other passengers, so we decide to carry our bags up the many stairs to the platform. We find our carriage and wait outside for them to open the doors and allow us to board. After a few minutes, we notice that not much is happening on this platform and we take a look under the train and see the bottom half of the attendants meeting passengers on the other side. What a mess - there seems to be a platform 1, we just cannot seem to get to it. Just like Platform 9¾ in Harry Potter. Fifteen minutes to departure and nothing to do, but "race" back and try to find out how to get to the platform. And race is used loosely. With all our bags, it is a real effort to go down and up the stairs to the different platforms. We make our way down to the underground passageway and then run to the one end to see if we can find out how to get there. Jacqui stays with the bags while Lars goes and explores. It turns out that the original entrance to platform 1 is blocked off as the station is under renovation, so the only way to get there is to leave the train station and go all around the building to access it from the outside. We arrive at the train with just five minutes to spare. It would have been a real headache to have missed this train. This is our first encounter (other then the one that slammed the door on Lars when he was trying to ask about the train when in search of the platform) with our provodnitsa - the lady who is in charge of our carriage. They can be good, bad and ugly. Ours is certainly not good or friendly. She examines our tickets like we are trying to enter the White House or Fort Knox. Then gruffly hands back our tickets and passports back to us and gestures us to get on. She turns out to be a mini-tyrant in charge of her mini-empire. She takes no prisoners. Ah, well - we only have to put up with her for a night. The train is very hot - a thermometer reads almost 40°C. Fortunately once the train gets going, the air con turns on and it works well, blasting cold air, with no controls, into the compartment. 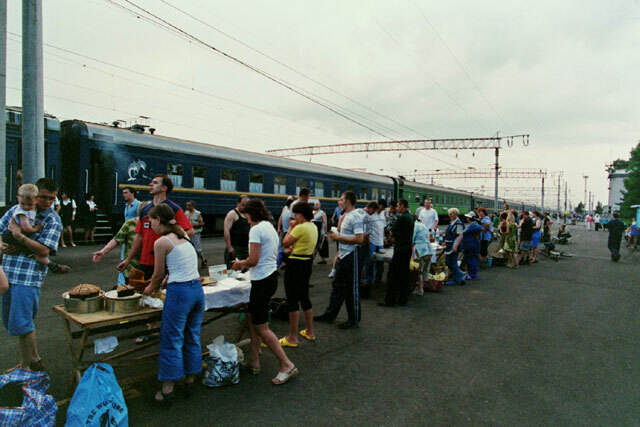 Our train (#006 - Okean) leaves on time and we settle into our compartment. We are traveling in first class (SV), where there are two beds in one compartment. There is enough space for us to comfortably put all our bags away. We do some reading, listen to some music and just watch the countryside go by. After about two hours, the train makes it's first stop at Vyazemskaya. We have about 16 minutes at the station and the locals have taken advantage of this - they have set up mini-stalls along the length of the platform and sell all sorts of food and drinks. And the regular passengers seem to know this as well - they appear to be stocking up for dinner and breakfast. The stallholders do a brisk business. We go out and check out what is happening, take some pictures and see if there is anything we would like to pick up. In the end, we choose some dumplings and a slice of a towering cake. Once back on the train and on our way, we decide to have dinner before going to bed. We make sandwiches from the cheese and salami that we have brought with us and supplement it with the potato stuffed dumplings. For dessert we have some fruit and the cake that we picked up at the station. The cake turns out to be very tasty - we will be looking for this type of cake during future train stops. It is now time to go to sleep - just one problem. The horrible music that the provodnitsa blares into the cabin continues unabated. We cannot find an on-off switch, so just have to put up with it. Finally, some time after 11 PM, the music stops - thank God!!! Now we can go to sleep.